This fun class is right for you if you are looking to improve your balance (B) and flexibility (F) while connecting socially (S). An added bonus is a good night's sleep. Simple provided equipment is used for additional muscle conditioning. A safe, fun invigorating class. Ideal for all fitness levels. A great cardio-class. Resistance equipment is used but not required. Session package or a Premium Membership. An exhilarating workout that offers a high intensity cardio workout and toning using various class formats. 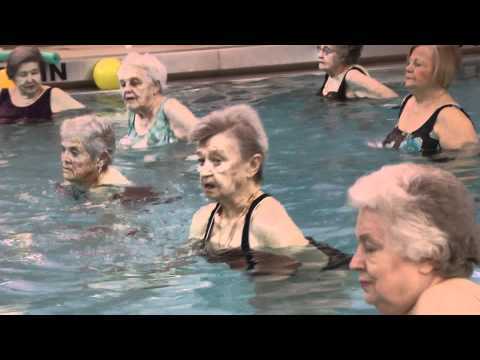 The music, the moves, the Latin rhythms, just like a Zumba class but in the water! It's a pool party! Bring some friends and have fun! A terrific resistance class that will increase your strength and muscle definition. You may purchase your own cuffs at the front desk or you may participate without using cuffs. 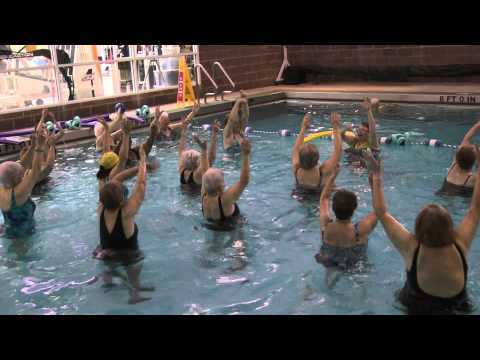 A low intensity water workout designed specifically for those recovering from injuries or surgery, older adults, overweight individuals, pre/post natal women and those with physical limitations such as arthritis, bursitis, osteoporosis, and back problems. Instructions are given throughout the class. A slightly higher intensity class than Hydroflex. Some mild rebounding is included but not required, alternative moves are offered, instructions are given throughout the class. Muscle endurance is a "plus" when you take your basic cardio workout to water, and this class is all movement all the time! Consecutive classes may include additional muscle conditioning. Perfect for those wanting to add a little resistance training to their weekly regimen. This class uses the properties of water along with resistance equipment to make your body stronger.